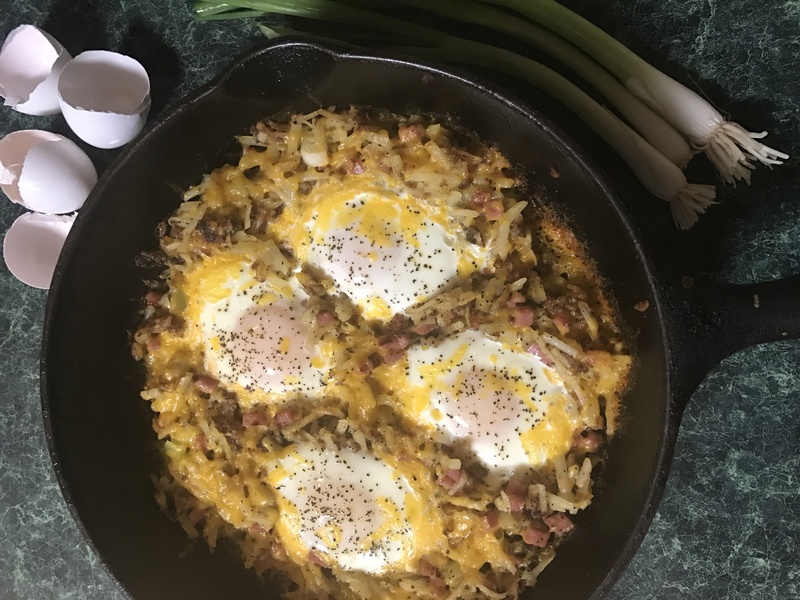 This is a great dish for breakfast & pair it with pancakes you have a wonderful breakfast or brunch…voila! Preheat oven to 400 degrees. In an ovenproof skillet (I use cast iron) heat 1 1/2 Tbsp. of butter. Add potatoes. Cook 8 minutes; flipping occasionally. Add green onions. Add remaining butter to skillet. Add ham; cook 5 minutes or longer to desired consistency of the potatoes. Make 4 or 5 wells in the potato mixture; adding an egg to each. Top with cheese, salt & pepper. Transfer skillet to oven and bake until the eggs are done; about 5 minutes.